I am a Southern California native, married for 32 years with 2 sons, one attending UCI and the other recently married to a wonderful woman and working in the family computer graphics business. I enjoy spending time with family and friends, reading, and listening to all kinds of music. I have had great fun raising “designer” Bantam chickens (fresh eggs are delicious). My interest in medicine started at birth… I was born in an ambulance! At Marque, I see workers’ compensation patients exclusively. My passion is helping these patients to heal and to get back their normal activities quickly, as well as to assist them in navigating the often confusing process of a workers’ compensation claim as painlessly as possible. 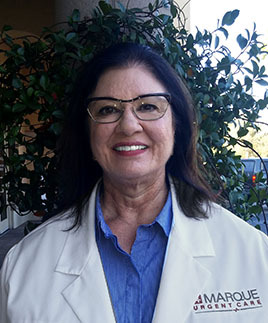 I am thrilled to work with a medical group such as Marque that is committed to serving these patients with compassion and excellent medical care.